"A forensic analysis of comments received between May 24th and May 30th shows that the FCC was flooded with 236,999 comments from domains in France, Russia and Germany," the group said. "The comments came almost exclusively from three email domains: Yahoo.fr (France), Mail.ru (Russia) and Yahoo.de (Germany). An analysis of hundreds of the comments shows that most appear to come from fake email addresses and fake physical addresses overseas." The online campaign against FCC chairman Ajit Pai's proposal to roll back net neutrality rules has been full of bots and fake comments from the start. Thousands of comments from John Oliver's "Go FCC Yourself" campaign used fake names, and many commenters used racial slurs and made death threats against Pai, forcing the comedian to ask his viewers to not be racist. The FCC voted last month to begin the process of reversing Title II net neutrality, which subjects internet service providers to broad federal regulation over how they manage traffic on their networks. The rules led to investigations into Verizon, T-Mobile, and AT&T for offering customers unlimited data streaming. 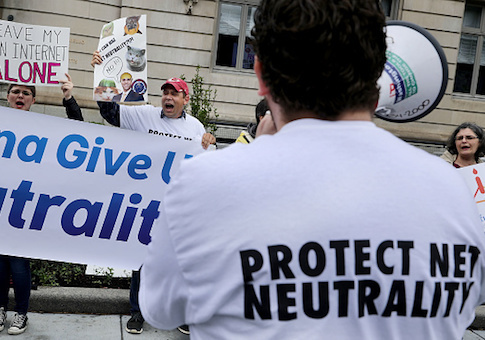 The National Legal and Policy Center revealed last week that one-fifth of all comments submitted in support of net neutrality appear to be fake, with thousands of submissions coming from the same email addresses. Nearly 5 million comments have been submitted to Pai's Restoring Internet Freedom proposal. Currently, the top filer names are listed as "Net Neutrality," "The Internet," "Smith," and "John Oliver." The latest analysis shows over a seven-day period 92,161 comments were submitted using a French domain extension; 84,618 from a German domain extension; and 60,220 from a Russian domain extension. "As we noted last week with the discovery of hundreds of thousands of fake comments in the docket, the full extent of compromised pro-net neutrality comments is not known," said Peter Flaherty, president of the National Legal and Policy Center. "But the gaming of the FCC's comment system appears to be massive and now encompassing overseas bot campaigns utilizing fake foreign physical and email addresses to submit comments." "Whoever is behind this massive deception is going to great pains to overwhelm the FCC's comment system to give the appearance of broad public support," Flaherty added. "But gaming the system to generate hundreds of thousands of comments from people that aren't even U.S. citizens and may not even exist is unprecedented." "To think that comments from foreign citizens could potentially influence a U.S. regulatory proceeding is very troubling," he said.